I got here through Joared...and Happy I Did! And a very Happy Thanksgiving to you...! Up early this morning and looking at your lovely table has made me hungry already. May you have much to be thankful for in the coming year. 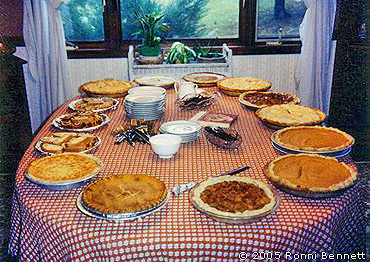 That's way too many pies for just you all--I'll be over around noon. Now THAT's my kind of meal--nothing but desserts! WOW! That has to be EVERY pie under the sky. Have a blessed, loving day Ronni. Happy Thanksgiving. Is that YOUR table?! All those pies. Wow. Save me some pumpkin. I wish that table was in my house! I love pie. Happy Thanksgiving Ronnie and Oliver! Happy Thanksgiving with all the trimmings! mmm, pie. I had pumpkin, of course! Looks like about one pie per person for our crowd. Please list the pies you had! We had pumpkin and apple.